Like every winter sun-spot once beloved of 1970s package tour operators, Lanzarote still hosts its fair share of Brits Abroad. But don’t worry, it’s easy to avoid them using our recommendations for the best places to stay in Lanzarote. The good news is that the burger and beer brigade voluntarily incarcerate themselves inside three resorts; and never leave. Which means the rest of this truly exquisite island – with its 300 volcanoes, lunar lava landscapes, romantic vineyards, wonderful seafood restaurants, world-class surfing, beautiful whitewashed villages and obligatory old men with donkeys – is completely unspoiled. 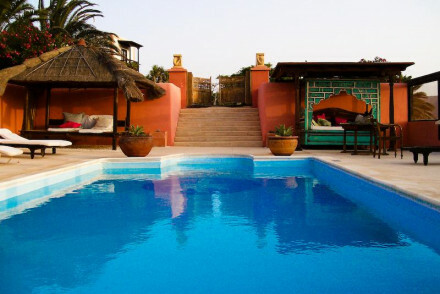 And plenty of the best places to stay in Lanzarote are too. Lanzarote's growing popularity as a destination for independent travellers has inspired local councils to improve the local sights and signpost some of the most spectacular walking trails. And this has fuelled the entrepreneurship of local folk with a bent towards hospitality, and a number of excellent rural hotels, fincas and guesthouses have opened in the last couple of years. Which means our Gurus have to keep going back to make sure they haven’t missed any of the best places to stay in Lanzarote. On top of the spectacular landscape and beautiful beaches, Lanzarote is culturally rich, with a number of museums and galleries of note, excellent marketplaces and lively local customs. Even if you’re more interested in sun and sand than the sights it’s still worth visiting the stunning landscape of Timanfaya National Park and the Montañas del Fuego. The island also has some incredible volcanic cave systems: Cueva de los Verdes is particularly spectacular. You might also want to visit the Cactus Garden? If you want to learn more about life on the island visit the Agricola Museum in Echedey. This island really will surprise you! As you'd expect with its permanent state of sunshine and subtropical climate, Lanzarote is a popular destination year round. All the Canary Islands are referred to as the ‘Islands of Eternal Spring’ and that’s a fair statement, though there is some fluctuation: in January, the coolest month, the maximum average temperature is 21°C, and in August and September, the hottest months, it’s 29°C. Lanzarote can be busy during the holiday windows, so if you want to guarantee yourself a room in one of the best places to stay in Lanzarote, we recommend you get organised and book early. For those who'd prefer a self catering option, check out the selection with our online partner, Booking.com. La Casona de Yaiza is an early 19th Century country hotel with first-class dining - this hotel has one of the best restaurants on the island. The rooms are lovely and tranquil, with huge bathrooms. Breakfast under the bougainvillea on ham with green olives, cold tortilla and excellent coffee. The Casa Rural Villa Lola Y Juan is a laid-back country hotel with just six elegant rooms and an impressive pool. Amongst the tasteful art and simple furnishings you’ll feel a world away from the resorts that give this beautiful spot a bad name. 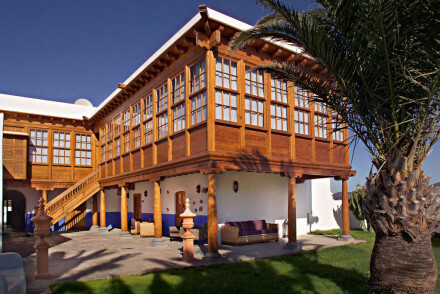 Casa del Embajador on the busy Playa Blanca, is a beachfront property converted from a former Ambassador's residence. Rooms are plain but charming and its only a two minute stroll to the beaches, restaurants and shops. 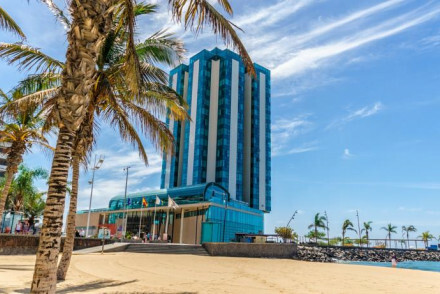 Right on the seafront at Arrecife, the Arrecife Gran Hotel & Spa is a superb modern hotel with 17 floors and 160 rooms. There’s a great Mediterranean restaurant with amazing views out to sea. 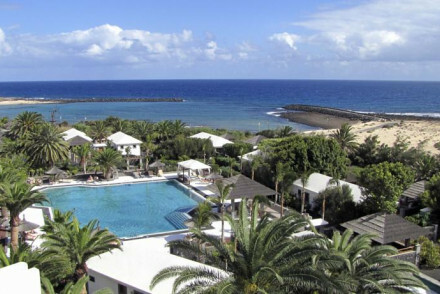 Barcelo Teguise Beach is a large, stylish, contemporary hotel right on the beach at Costa Teguise. The minimalist rooms are crisp and white - which is fine ‘cause it’s adults-only. This is the perfect place to try windsurfing! Playa Blanca’s Princesa Yaiza Suite Resort Hotel is a deluxe seaside resort with five star facilities and beautiful bay views. This is a huge resort hotel with six pools and extensive spa, eight restaurants and loads of activities on offer. 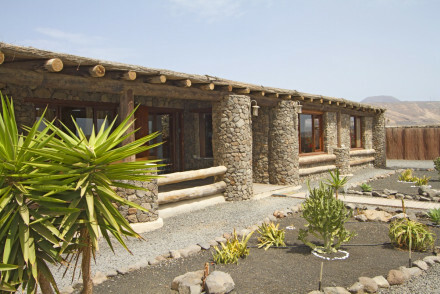 Casa el Morro is a charming collection of suites, self catering houses and a yurt. 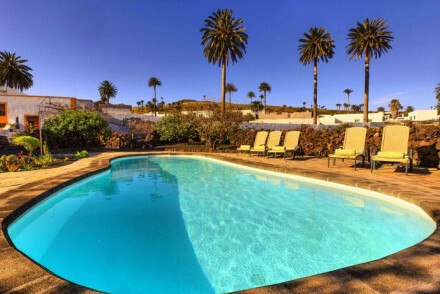 Situated in a quiet part of the island it is one of the best places to stay in Lanzarote for families or groups and is fantastic value for money. In the heart of the island, Finca Malvasia is a complex of guesthouse and four apartments set amid vineyards. The apartments are arranged around a stylish pool area. Interiors are contemporary with a rustic twist. Casa Tomaren offers seven luxury villas plus a pool to die for, created from a volcanic sinkhole! Interiors are a super stylish fusion of Spanish, Moroccan and Indonesian. It's the perfect place for a large get together with friends or family. 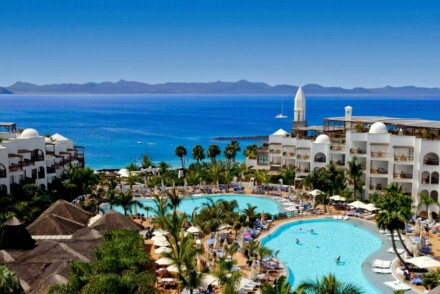 Overlooking the port of Marina Rubicón, on Playa Blanca, The Volcan is a stunning five-star hotel with 250+ luxurious rooms and suites, sprawling outdoor pools, a large spa and five restaurants. Perfect if you’re looking for a relaxing haven of a resort, La Isla Y El Mar is a collection of 80 plush rooms and suites. There’s a luxurious spa, a cool bar, two restaurants and a laid-back, romantic vibe. 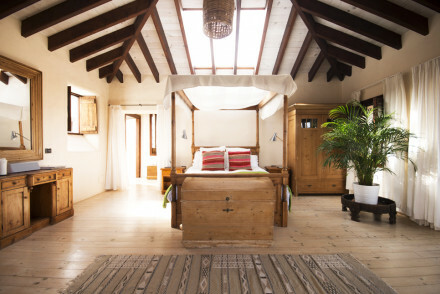 The Finca Cottage Aloe is a charming, four-person cottage in the small town of Teseguite. The kitchen is fully equipped, there’s a pool and a jacuzzi, plus plenty of puzzles, board games and a garden and BBQ area. 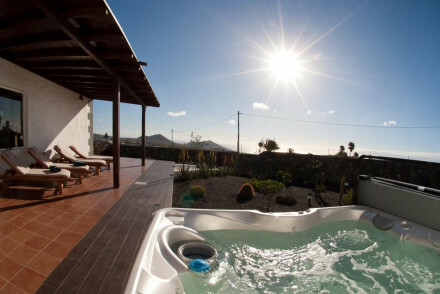 Casa de Hilario is a beautifully appointed guesthouse with seven bedrooms. Furniture is handmade and the materials used are a great mix of the modern and rustic. Charming terrace and tiny pool for cooling off. 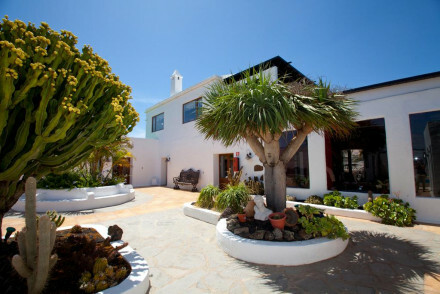 Caserio de Mozaga is a a family run, family friendly B&B in the heart of Lanzarote. There are eight simple but stylish bedrooms, two with private sitting areas. The only downside is the lack of swimming pool, but it makes an excellent base for exploring the island. Villa Vik is all luxury, all the time. Smart and sophisticated, with great little touches like free champagne on arrival and lovely toiletries, the pool area is a must and if you can drag yourself away the capital Arrecife is a short stroll along the seafront. Lani’s Suites de Luxe is a stunning, adults only modern hotel with white decor and a soothing atmosphere. There are 25 suites - most with fantastic sea views - plus direct access to the beach and a charming Mediterranean restaurant. At the pricier end of the B&B scale, the Buenavista Country Suites is a two room, family-run B&B designed with simple style and elegance, complementing the spectacular mountain views. Perfect for couples. The Eco Finca De Arrieta is a relaxed, family-friendly, 12 room eco-escape with accommodation arranged in yurts or villas. The finca is surrounded by mango, banana and lime groves and you’re just 300metres from a golden, sandy beach. The Alondra Villas & Suites are a collection of luxury four-person villas and suites. Villas have a fully-equipped kitchen, comfortable seating areas and their own pools! There’s also an indulgent spa. 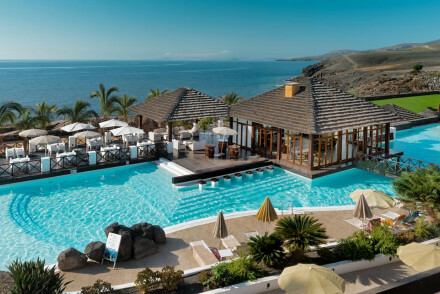 Hesperia Lanzarote is a luxurious, 300+ room seaside hotel with an emphasis on sports and activities: there are tennis, squash and volleyball courts, mini golf, a huge playground and several pools. There’s also a kid’s club. 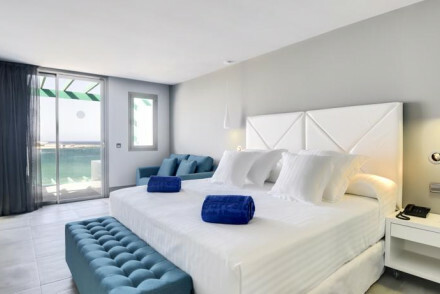 The Aqua Suites in Puetro del Carmen are a collection of stylish, spacious contemporary hotel suites, each with a private balcony with great ocean views. There’s a lagoon pool and it’s just a short stroll to the beach. The Finca Marisa is a cheerful, five room B&B in the small village of Tinajo. The rooms are spacious and traditional and the mountain views from the communal terrace are spectacular. And the prices are very affordable. Even smaller, the three room El Jallo is part of an organic farm. The accommodation has been converted from a 17th century building with beautiful wooden floors and beamed ceilings. The views are really something from the pool and terrace and there are lovely gardens. Perfect if you want some peace. At the pricier end of the B&B scale, the Buenavista Country Suites is a two room, family-run B&B designed with simple style and elegance. Perfect for couples. If you're looking for your own little home from home, then perhaps a villa or apartment is the best option. We recommend you check out the properties with our online partner, Booking.com. Most people arrive on Lanzarote at Arrecife airport, which is on the island’s east coast, about three miles from Arrecife town and about six miles from Puerto del Carmen. If you haven’t arranged transfers or car hire you can catch a bus from the airport to Arrecife, where you can change for other destinations. As we mentioned the weather in Lanzarote makes it a year round destination, with sea breezes taking the edge off the heat in summer and winter nighttime lows rarely falling below 14°C. For many people the best times to visit Lanzarote are when it’s awful everywhere else! But if you enjoy swimming in the sea then you’ll love the summer, when the sea averages at a balmy 22°C. If you want to hire a car - which we highly recommend if you want to see more than just the headline sights - we recommend you visit our online partner, Rentalcars. 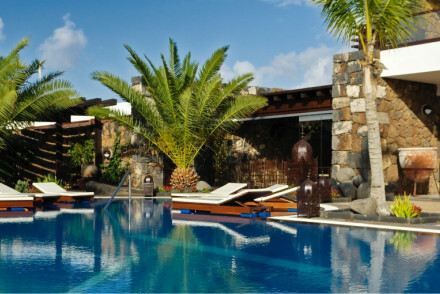 Still not sure which is the best place to stay in Lanzarote for you? 19th Century country hotel with stunning views, outdoor pool and manicured gardens. 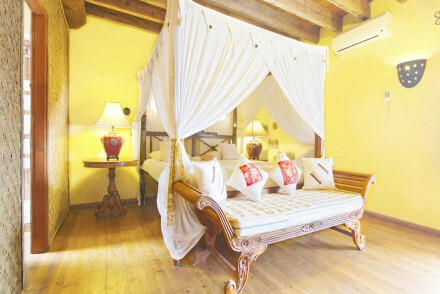 Lovely rooms and huge bathrooms are decorated in white, wooden floors and oil paintings. Enjoy the islands favourite restaurant with its popular Mediterranean and Canarian dishes. Rustic elegance and gourmet cuisine. Foodies - Considered by many the best restaurant on the island, the menu is creative and exciting with bold splashes of flavour. Active Holiday - Jose will help you to arrange practically any activity you can think of, from diving to riding and hiking. Fishing - In season (May to December) head out deep sea fishing for big game such as marlin, tuna and wahoo. Great walks - Enjoy a sunset stroll along the beaches or in the manicured gardens of the hotel. Villa Lola Y Juan is a laid-back country hotel brimming with character and personality. The rooms exude an understated elegance with simple furnishings and tasteful artwork. Relax by the deluxe pool or visit nearby caves. 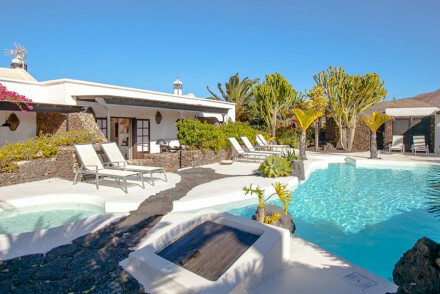 A far cry from Lanzarote's resorts it's ideal for an intimate escape. Romantic Break - Offering a great deal more intimacy than the vast resort hotels of Lanzarote, it's great for a romantic break. 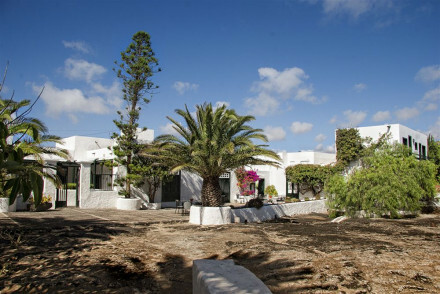 Local exploring - This country-style hotel is perfect for exploring the lesser travelled North of Lanzarote. Local markets - Browse the Mercado Tradicional de Haría and pick up some souvenirs to bring home with you. Sights nearby - Explore the fascinating Jardín de Cactus. Relaxed family-friendly eco escape. One can either stay in the eco tower, an eco villa or one of the magnificent marble-floored yurts surrounded by mango, banana and lime groves. The plethora of activities and proximity to the beach make it ideal for families or groups. Families - The group accommodation and self-catering suites are ideal for families, plus playground and trampoline for the kids. Eco break - Eco-friendly destination, completely off the grid powered by wind turbines and solar panels. Kayaking - A nearby watersports specialist offers sea kayak safari's, a totally new way to explore the coast. Quiet 18th Century family farm turned boutique hotel, with charming bougainvillea framed courtyard. With white washed walls, high-beamed ceilings, shuttered windows, and original family antiques give warm traditional feel to the rooms. The stables are now a lively restaurant, popular with locals. Foodies - The restaurant, serving traditional Canarian cuisine using locally-sourced produce, is always guaranteed to please. Local exploring - Perfectly positioned for exploring the island by car or bike, from the volcanoes to the beaches and villages. Great walks - Whether along the beach or in the Timanfaya National Park - there are fantastic walks to stretch your legs. Rural chic setting fitted with a film-star pool. Six luxury villas with Moroccan and Indonesian influences and surrounded by vineyards, orchards and gardens. A perfect oasis for families and groups of friends on the island for a relaxing holiday. Families - Ideal for a family getaway, self catering villas with pool access, close to the beaches and babysitters on standby! Birdwatching - La Geria,the neighbouring nature reserve is an ideal spot for birdwatching. Great walks - Explore the national park and volcanic peaks. An eco friendly collection of self-catering suites and one large yurt. Brightly decorated rooms, lovely terraces, stepped gardens, charming swimming pool area, and a yoga hall. A relaxed spot to explore the coast and Natural Park from. Ideal for yoga lovers, families, and those on a budget. Yoga - The hotel has its own yoga hall, twice-weekly yoga sessions. Eco break - Recycling, solar power. 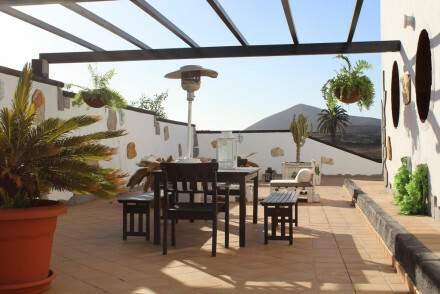 A delightful family-run B&B offering an intimate escape from the resorts and tourists of Lanzarote. Designed with simple style and elegance, the suites exude a rustic chic feel with earthy colours and superb mountain views. Ideal for couples looking for a peaceful, relaxing holiday. A quiet wonder. Hideaway - A secluded and intimate escape, tucked away in La Asomada, boasting spectacular views over the stunning mountain landscape. Great walks - Go walking in the beautiful Montañas de Fuego Mountains. Sights nearby - Visit the nearby Campesino Monument. 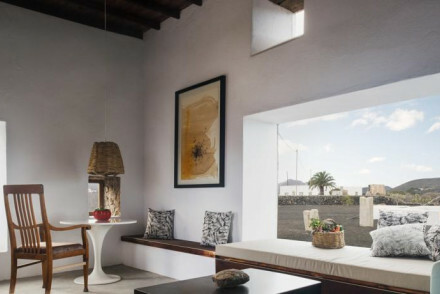 A stylish contemporary hotel, on the beach in Costa Teguise. The chic rooms feature minimalist furnishings and crisp white colour schemes. Relax on the nearby beach or for something more outgoing, take a windsurfing lesson. Adults only makes it perfect for a luxurious break away from the kids. Romantic Break - This adults only hotel sits minutes from the promenade, with its vibrant nightlife and boasts a pampering spa and restaurant. Beautifully restored 18th-century cottage just outside Yaiza Village, boasting ocean and mountain views. Contemporary interiors with rustic touches, large bright bedrooms and hand painted decoration. A perfect base for exploring the Island, with owner José as your always helpful guide. Local exploring - Owner José is an indespensible local guide, whether you're into exploring secluded beaches, deep sea fishing or mountain biking. Value chic - This place is a steal- with charming rooms, chic interiors, phenomanal breakfast and Jose's personal touch. A superb modern hotel on the seafront in Arrecife. The luxurious rooms are spacious and comfortable with many affording stunning seaside vistas. Head to the 17th floor for sumptuous Mediterranean cuisine and unparalleled sea views. Perfect for a relaxing break on the beach. Total relaxation - With a stunning seafront location, a deluxe spa, and phenomanal Canarian cuisine- it's perfect for a relaxing break. Four self-catering cottages set in a charming, working vineyard. An oasis of tranquility with beautiful central pool area and stunning grounds. Built in hommage to the island's famous designer César Manrique, they embody rustic Canarian with a simple modern twist. Sweet and chic. Families - Self catering cottages, with a pool and plenty of space for running around, only 20min drive to the beach. Great walks - Take a guided tour throught the dramatic volcanic scenery, your helpful hosts will organise it all at the drop of a hat. Diving - The Canary Islands are known for their crystal clear waters, be sure to check out the dive centres on the island. An excellent five-star hotel overlooking Marina Rubicón Port. The hotel is well equipped to meet guests needs, with luxurious rooms, sprawling outdoor pools, a large spa and five restaurants ranging from Japanese to Italian. With a heavenly strand nearby, it's perfect for a beach break. Families - With on site kids' club and a wide range of on site activities, plus a spa for the adults, it's perfect for all ages. Total relaxation - With deluxe suites, an excellent spa and beautiful nearby beaches, it's a great spot for a relaxing holiday. Fishing - Take day fishing trips from Playa Blanca and explore the coast from another perspective. Great walks - Make the most of the great walking in the nearby Timanfa National Park. Converted fisherman’s cottages in a popular resort. In the thick of all things yet secluded - minutes from the beach, cafes, restaurants and shops. Freshly decorated in greens, whites and terracotta floors. A lovely sea front terrace to admire the views from. A low key spot for couples. Romantic Break - Perfect for couples without a car, within walking distance of Playa Blanca and the beach, but peaceful and private. Great walks - The hotel faces over the strait of La Bocaina and the Bay of Playa Blanca, both lovely spots for a post breakfast stroll. Sailing - Private sailing excursions and charters are available nearby and an ieal way to explore the coast from another angle! Diving - Check out one of the many dive centres on the island, the crystal clear waters are ideal for exploring. 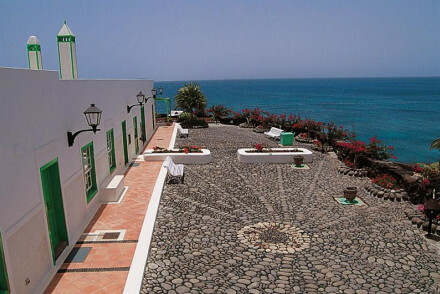 Splendid villas and suites away from the centre of Puerto del Carmen. The four person villas offer stylish rooms, a fully-equipped kitchen, plush seating areas and pools. Perfect for families and groups looking for a little more intimacy than an ordinary hotel might offer. Groups - The four person villas, with self catering kitchens, dining areas and indulgent spa are perfect for luxury group holidays. Total relaxation - Pamper yourself with a chilled out beach holiday, lounge by the pool, steam in the Hammam or wander down to the beach. Sights nearby - Visit the fascinating Campesino Monument, dedicated to Lanzarote agricultural traditions. Great walks - Take a day trip to the stunning Montañas de Fuego Mountains. A luxury seaside hotel with an emphasis on sports and activities. The modern rooms are plush and spacious, many with stunning sea views. Boasting onsite water sports facilities, tennis, volleyball and squash courts, it's perfect for an action-packed family holiday. Families - With a miniclub for children, lots of watersports facilities, mini golf, a playground and several pools its kiddie heaven! Great walks - Make the most of the lovely walking trails in the nearby Timanfaya National Park. Sights nearby - The hotel sits nine miles from the Campesino Monument. Grand-daddy of five-star resorts. Garden of Eden-like with its botanical garden courtyard and white sand beaches. Beautiful suites have private balconies and sea views. Eat well at the restaurant, catch sunset with a drink and enjoy the many water and land sports on offer. Active Holiday - The Social club has its own basketball, handball and volleyball courts, as well as access to mini golf. Total relaxation - Lounge by the pool, relax in the sauna or indulge in a full body massage. Restrictions on children - Recommended adults only. A charming four-person cottage in the small village of Teseguite. With two comfortable, spacious rooms and a fully equipped kitchen it's perfect for a group holiday to Lanzarote. Sunbathe by the pool or visit the nearby LagOmar Museum. In the evening watch the sun go down from the jacuzzi. Families - With plenty of room to run around, board games, puzzles, books and a highchair- it's ideal for a family getaway. Groups - A charming four person self-catered cottage, with a lovely garden, bbq area, outdoor hot tub and dining area. Diving - Superb scuba diving opportunities at Costa Teguise, Playa Blanca and Puerto del Carmen. Great walks - Great walking amidst the volcanic landscape of the nearby Jardín de Cactus. Smart and sophisticated, resort with modern interiors and classical touches. Large comfortable suites come with private terrace overlooking the lovely pool area. Locally sourced produce can be seen on the menu, and delicious cocktails at the Terrace Bar. A popular spot for weddings and romantics. Total relaxation - Refresh and rejuvenate- with no kids allowed, in room massages and reiki sessions, poolside bar and luxorious suites. Romantic Break - The larger suites come with a private Jacuzzi on your terrace for moonlite dips. Sights nearby - Just 200m down the road is Playa del Cable, head down for some surf, sand and sun. Great walks - Walking around the volcanic peaks makes for an active afternoon. A stylish contemporary hotel on the seafront. Each suite is fitted with comfortable, modern furnishing and a private balcony with great ocean vistas. Recline by the lagoon pool or take a stroll down to the nearby beach. The spacious suites are great for a family holiday. Value chic - A cool contemporary beachside property, boasting spacious suites, half board and lovely lagoon pool at a reasonable price. A deluxe seaside resort brimming with five-star quality. The elegant rooms exude simple style with contemporary furnishings and balconies overlooking the bay and gardens. With eight restaurants, an extensive spa, six outdoor pools and countless sports facilities, there is something for everyone. 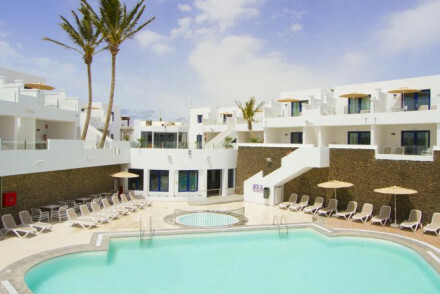 Families - With large rooms, a kids club, a playground, a spa, bar and games room, it's perfect for a family holiday to Lanzarote. Beach Life - Three minutes walk from the beach with access to snorkelling, diving, and swimming. Diving - The hotel can organise diving expeditions along the surrounding coastline. La Isla y El Mar is a relaxing haven, exuding a serenity that is often missing from Lanzarote's big resort hotels. With plush suites, a deluxe spa, a cool pool bar and two restaurants, it's got a host of great services on offer. Perfect for peaceful, romantic break on the Atlantic. Romantic Break - With deluxe suites boasting outdoor jacuzzi's overlooking the Atlantic, it's ideal for a special getaway for two. Great walks - Make the most of the excellent walking trails in the Parque Nacional de Timanfaya. A stunning modern hotel with a tranquil soothing atmosphere. The fashionable suites feature chic furnishings and bright white colour schemes and fantastic views out to sea. In the evening sample delicious Mediterranean cuisine right on the beachfront. A seaside oasis. Romantic Break - Brimming with style, the deluxe suites are perfect for a relaxing, romantic break in this chic adults only hotel. Great walks - Go walking in the stunning Montañas de Fuego Mountains.